The Neolithic Site of Shkārat Msaied is situated approx. 16 km north of Petra/Wadi Musa in Southern Jordan. Nearby are several other Neolithic sites, e.g. Ba’ja, Basta and Beidha, on which the applicant has also worked in recent years. The site was excavated from 1999 to 2001 as field school project (at that time of the Carsten Niebuhr Institute) and from 2002 to 2005 as a Carlsberg Foundation funded research excavation project carried out by the Institute of Cross-Cultural and Regional Studies- ToRS, University of Copenhagen, followed by a study season and an excavation season in 2010. The site dates into the Pre Pottery Neolithic B and shows clusters of circular house structures. 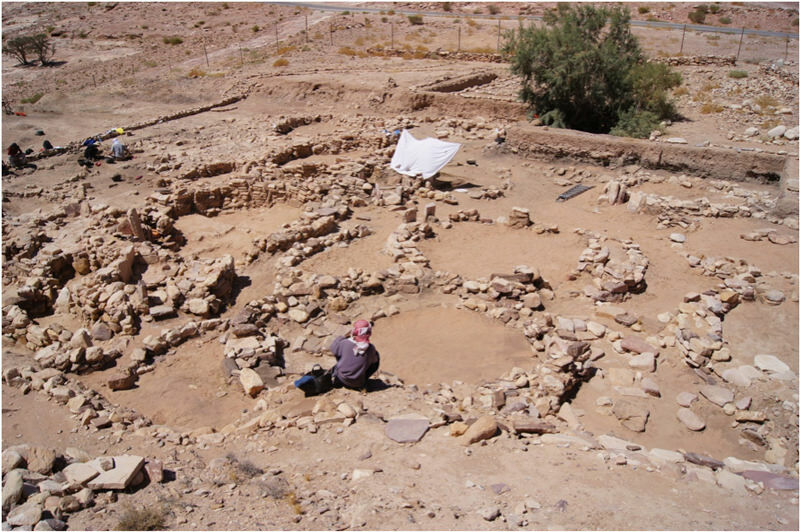 The preservation of the structures is quite well and the archaeological context shows complex activities and a series of modifications towards rectangular shapes. 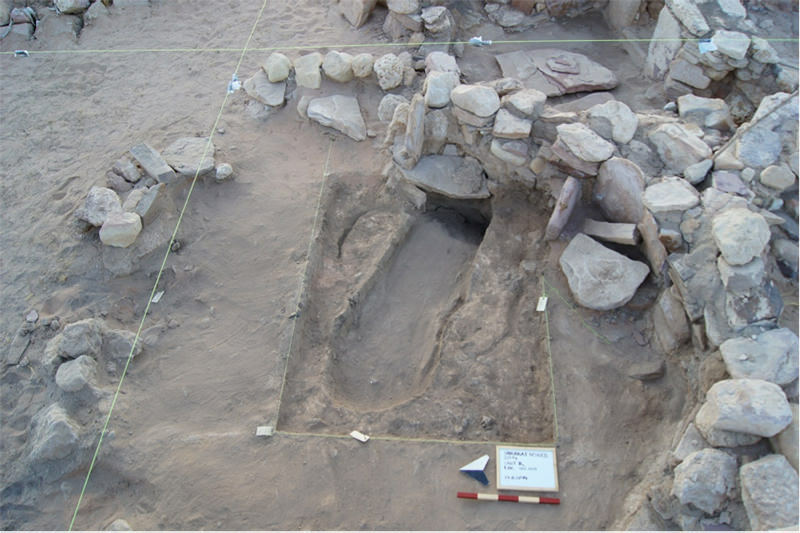 Burial practices and the modification of space seem to be linked very close to each other in Unit F, influencing also the development of the entire settlement. 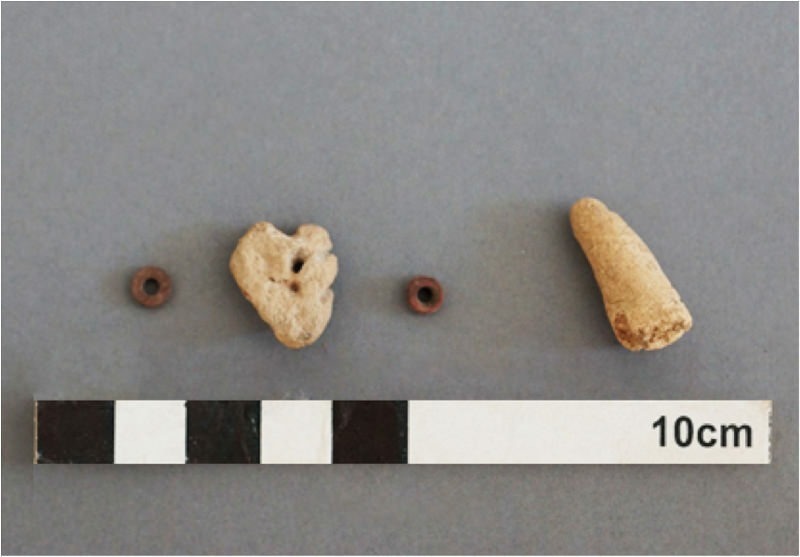 The targeted archaeological interventions should add considerably to the existing dataset needed for a wider interpretation of the site in its Neolithic context. During a visit in 2013 severe illegal digging activities were observed that call for ad hoc salvage activities to record the damages and the state of conservation as well investigate in limited areas prior to the planned final excavation seasons. The aim of this 2014 season (17.8. to 31.8. 2014) was to document, clean and extend the trench illegally dug in Unit R to gain a “deep” sounding and insight into earlier occupation horizons including 14C sampling etc. if possible (Fig. 1). 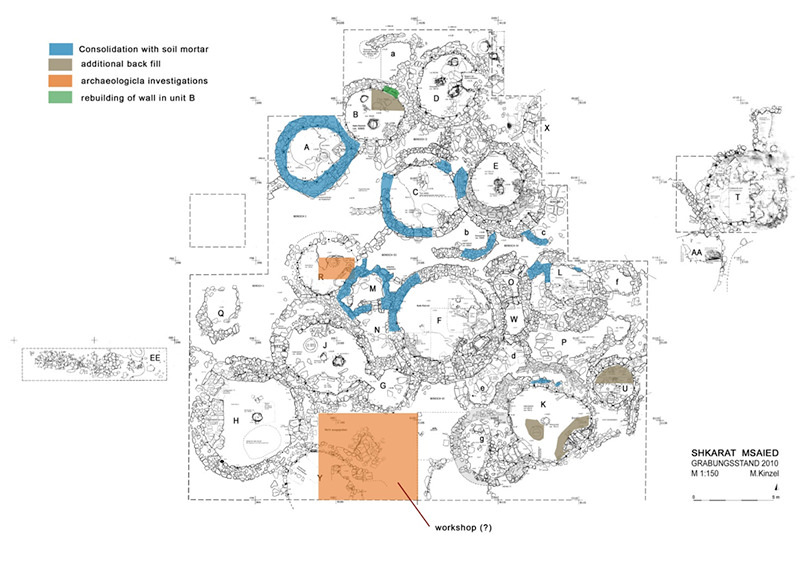 The findings in the area of unit R turned out to be even more complex than the first investigation in summer 2013 has indicated (Fig.2). Due to the ad hoc backfill of most of the illegally dug material by the Petra department and the dense occupation layers, as well as the high find concentration the bottom of the illegal “trench” could not be reached during our work period. Nevertheless the excavation revealed so far a series of nine occupation layers with very distinct differences (Fig.3). The rich find density of the mix matrix created by the illegal digging and “backfill” is also reflected in these occupation layers. 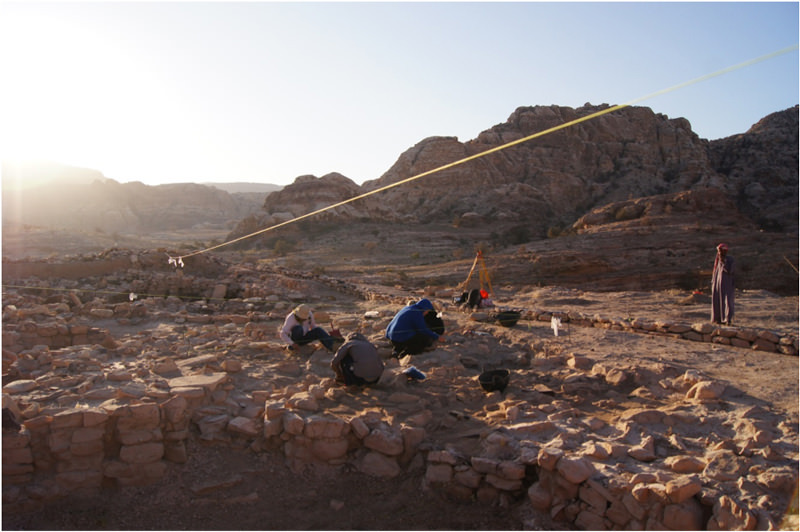 Some of the finds from the mixed matrix can actually linked to occupation surfaces with similar in situ finds, e.g. a potential sandstone bead production workshop (Fig.4). It is planned to continue the works in this area in the coming season to reach bedrock or virgin soil. Further the southern area between the units F, G, H, J, K, g, and Y has been investigated to gain more information of its function and use. In 2010 we started to excavate this area. But only in a few parts floor surfaces were reached. Use and function were still unclear. This area shows several compartments with plaster floors, and pavement, but not a really clear structure. Our work focus was therefore clear out the area to achieve a better understanding of the overall settlement layout. In this area (Loc. 100.208/212) a potential posthole (Loc. 100.203) was discovered between unit Y and g (Fig.5). The area previously defined as an open space (area VI) could possibly be roofed. Shape and dimensions suggest that the post was formed by more than one “trunks”, which could be mean that the roof could have been quite substantial, following the construction we know from Unit K. Some upright placed stone slabs could indicate remains of possibly an earlier round house structure. The findings clearly show here a series of modifications and adjustments due to changed functions and needs. In the context of Loc. 100.212, a hard packed clayish surface, a possible flint knapping workshop was exposed. In addition to the above presented archaeological investigations the state of conservation of each building unit was assessed and documented. The report was handed over to the Department of Antiquity to be included in the MEGA database. In general the site is in relatively good condition. The fence around the site is in good conditions, but would require in the future a proper gate/door to allow access. Most damaged seems to be related to the intense rainfall in winter 2013/2014, but also vandalism. 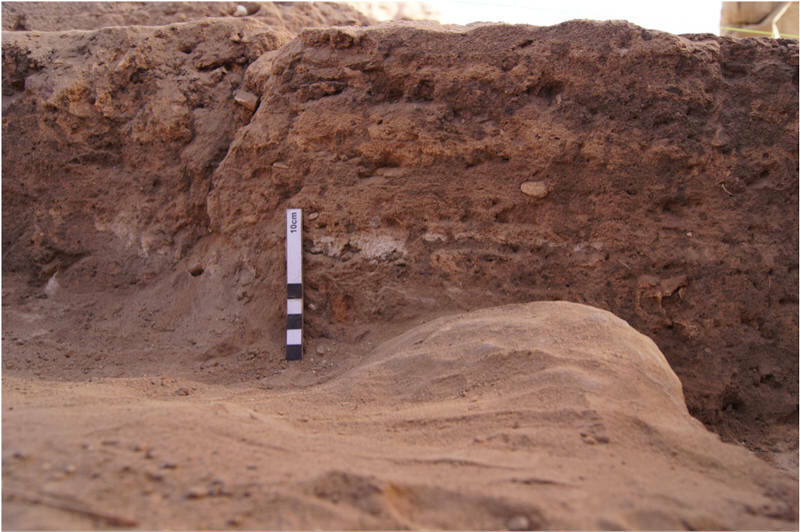 On the other hand also the exposure of the remains to weathering, including intense sun and wind, has resulted in the loss of bonding of the historic Neolithic wall mortars as well as the disintegration of the (sand-) stone material itself. Especially the sand stone slabs showing flaking and detachment of layers, etc. However the backfill executed in 2010 seems to fulfil its purpose to stabilize the structures. The surface run-off water in relation to the heavy winter rainfall has created some drainage gullies in the backfill material. In some cases (Unit J, K, P) single wall segments between the post channels (sockets) are collapsed due to the loss of bonding and rainwater penetrating the wall core. To reduce the risk of wall collapse some stabilization and consolidation works were executed. In Unit A, C, E, F, K, L, and M joints were re-pointed and voids filled using a (simple) soil mortar. The same mortar was used to complete some wall capping to prevent water penetrating the wall core. The mortar has to be seen as a sacrificial layer. Regular monitoring will help to define maintenance cycles necessary to maintain the cur-rent state. In addition to the consolidation measures some backfill was carried out in a few areas to prevent collapse respectively water penetration. 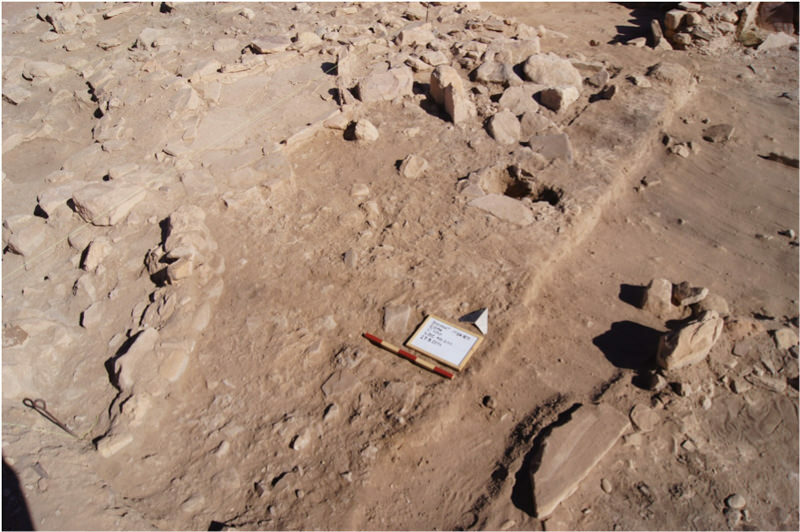 To improve the appearance of the site and to protect the remains all building units were cleaned off of plants and litter (Fig.6). Anne Mette Harpelund, Khaled Hwawra (Representative of the DoA. ), Jakob Hellum, Moritz Kinzel, Pia Nielsen, Ingolf Thuesen, Mette Thuesen, Khaled Said al Ammarin, Abdallah Attalah Hamdan Madala (workmen). We are grateful for the support by the Danish Institute in Damascus which has made this year’s fieldwork possible. We also would like to thank Christoph Purschwitz, Free University Berlin, for his support and quick flint study. Barbora Kubikova and Klara Matulova, Masaryk University – Brno joint us in the trench for some time.